October 12, 2015 – NASA has awarded the University of Colorado Boulder’s Fiske Planetarium $1 million for the development of short, full-dome videos about space science-related discoveries that will be distributed to hundreds of planetariums nationwide. The project, led by Fiske Director Douglas Duncan, will target the general public, K-12 students and college students and provide videos to more than 200 planetariums. The project, which will involve CU-Boulder students, is expected to advance STEM and other national education efforts and improve U.S. science literacy. CU-Boulder is one of 27 science education partners selected by NASA. Others include the American Museum of Natural History in New York, the University of Washington, the University of Michigan, Arizona State University, the University of Texas Austin and the Space Science Institute in Boulder. The selections were made by the space agency’s Science Mission Directorate (SMD) through the Science Education Cooperative Agreement announced in February. The activities of the 27 winners will support Earth science, astrophysics, planetary science and solar physics activities regularly undertaken by NASA. While some 20 million people visit planetariums each year, most facilities don’t feature new discoveries because they don’t have the staff to produce such videos, said Duncan, who also is a faculty member in the Department of Astrophysical and Planetary Sciences. 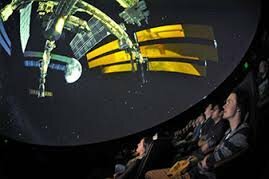 But CU-Boulder will be using experienced planetarium staff members and hiring talented Film Studies Program students for the effort, he said. The space news pieces will be produced at Fiske under the direction of Duncan and the planetarium’s video producer, Thor Metzinger. Each piece will be 2 to 4 minutes in length and will report on new findings of interest to the public, said Duncan. Because of the high quality of CU-Boulder research, at least some of the short videos will likely feature new university science findings, said Duncan. CU-Boulder is recognized as a national leader in astronomy, aerospace and Earth sciences and is the number one public university in funding from NASA. Duncan said that short radio feature programs like “Stardate,” produced by the McDonald Observatory at the University of Texas, and “Earth & Sky,” syndicated by NPR, built audiences that reached 13 million people. Funded projects for the new NASA initiative at other selected institutions include using NASA data to explore weather, NASA science for Girl Scouts and science education associated with the upcoming 2017 total solar eclipse over North America.